Welcome to part 5 of my 7-part series on dictators, an irreverent guide to some of history’s worst people and part of my effort to bring geopolitics and history to people who want to sound thoughtful at dinner parties but are too lazy to read The Economist. I’ll be releasing a new segment of this essay each week. If you’d like the entire essay now, please join my mailing list and I’ll send it to you. It’s that easy! You also missed part 2? Read it here. Damn, you also missed part 3? What’s up with that? Read it here. Seriously, you never read part 4? That’s messed up. Read it here. Want more laughs? 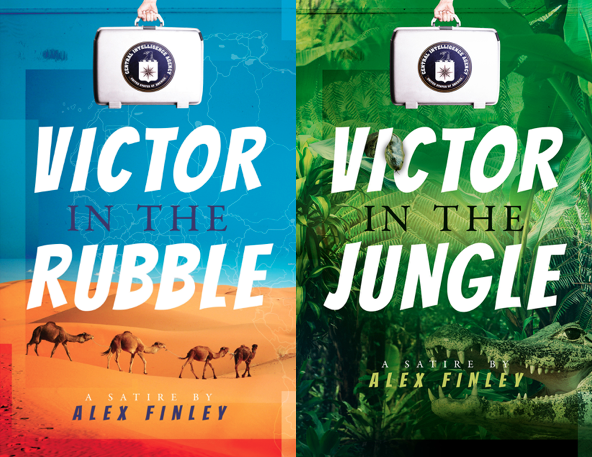 Check out my novel, Victor in the Rubble, a satire of CIA and the War on Terror. One reader “thought it would be funnier,” but agreed it was “still a very enjoyable book.” I hope you’ll check it out. In the meantime, enjoy learning about dictators! Last week we discussed Equatorial Guinea’s Teodoro Obiang, the man bold enough to hold the title of Africa’s longest serving dictator. Hot on Obiang’s tail for the top title is Robert Mugabe, the 92-year-old president of Zimbabwe. Oddly, Mugabe was actually elected, in 1980. He then declared a one-party system, consolidated power, and never looked back. Mugabe at first received accolades from around the world. Queen Elizabeth II made him an honorary knight in 1994 and numerous western universities bestowed him with honorary degrees. But then he must have done something to piss people off. On the advice of her foreign minister, the Queen revoked Mugabe’s knight title and all those universities started taking back their diplomas. It might have been Mugabe’s proud reference to himself as “the Hitler of the time,” or an evenhanded policy called Operation Drive Out Rubbish, in which hundreds of thousands of Zimbabweans awoke to the realization that the rubbish being referred to was them and their homes. Or maybe it was his visionary economic reforms, which included kicking out of southern Africa’s breadbasket nearly every single person who knew anything about farming and led to enviable inflation, which reached 231,000,000 percent in 2008. You needed a wheelbarrow full of cash to buy a loaf of bread. The Zimbabwean dollar was suspended the following year, presumably because the country had run out of zeroes. But Mugabe has been keen to say he never worried about having his fancy titles taken away. And anyway, in January 2015, he got himself a new fancy title, when he was named chairman of the Africa Union, which aims to promote democratic principles on the continent, principles like freedom of the press. Except that everyone saw it and captured it on film. So while he tried to stop people from discussing his frailty (He was 91! It happens! And even his Information Minister, while denying the fall, said “even Jesus” would have tripped on the badly laid carpet), he instead drew way more attention to it, and soon a meme was traversing the Internet, in which Mugabe’s fall was made to look like he was playing football, surfing, skateboarding, riding a dragon, and my personal favorite, dancing on Dancing with the Stars. Robert Mugabe on Dancing with the Stars, where he captured 99.9 percent of the vote. He hopes the show won’t revoke his Mirror Ball trophy. In my view, Mugabe’s Information Minister missed a great opportunity to explain to the world that Mugabe was simply demonstrating that he invented gravity. But if his fall and his age have you worried about Zimbabwe’s future, don’t be. Mugabe seems to have a succession plan in place, and her name is Grace. Or DisGrace. Or Gucci Grace. Depends on who you ask. She is a prominent player in Zimbabwe’s leading (only) political party, Zanu-PF. Oh, and I should probably mention: She is Mugabe’s wife. Grace Mugabe is 42 years younger than her light-footed husband, and she’s no slouch. Despite dropping out of school after failing a correspondence course at the University of London, Grace has shown astounding academic acumen. She earned a PhD in sociology from the University of Zimbabwe in September 2014, just two months after enrolling. Her thesis is so mind blowing that the university refuses to release it because we mere mortals can’t be trusted with that kind of information. It should be noted that the chancellor of the University of Zimbabwe just happens to be one Robert Mugabe, President of Zimbabwe. Dr. Grace Mugabe built two palaces. She bought the land for the first one at an 80 percent discount, using a government-housing scheme meant to help low-paid civil servants. To be fair, Grace did start out as Mugabe’s secretary. And she claimed she used her salary as a secretary to build the half-a-million-British-pound home. She later sold it to the Godfather of African Dictators, curly-haired Qaddafi, and pocketed a two-and-a-half-million-pound profit. For that, they should give her a PhD in economics. She used the profits to build a second palace, called Graceland, because apparently she was hoping to do drugs and gain weight. Graceland served as the backdrop for the three-million-pound wedding of the Mugabes’ daughter. Zimbabweans pushing their wheelbarrows to the bakery must have been thrilled to hear the Mugabes paid for the wedding straight out of the national treasury. Understandably, Grace seems to think that state-run diamond mines are her own piggy bank. Who else would that money be for? It’s not like the Zimbabwean people should get paid. They obviously don’t have jobs, otherwise they wouldn’t be homeless. And she is the First Shopper, after all. While her people have their homes bulldozed and search for food on the farms that are no longer producing because all the Mugabes’ best friends are now living there, Grace shops, with trips to London and Paris. Not because she wants to, but because she has “narrow feet” and thus needs special shoes, like those made by Ferragamo. However, due to U.S. and European Union sanctions on her, Grace now shops in Hong Kong.